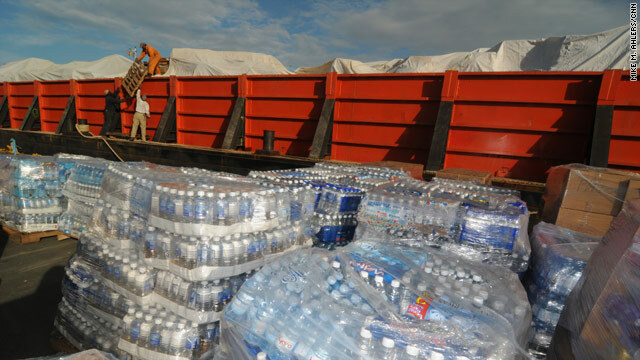 At the port of San Juan, Puerto Rico, stevedores prepare a barge filled with provisions for Haiti. The barge set sail Friday and is due in Port-au-Prince Monday morning. San Juan, Puerto Rico (CNN) -- Puerto Ricans are calling it the Barge of Hope, but you could call it "The Love Boat." It is 250 feet long, 80 feet wide and loaded five pallets high with food and water, medical supplies, generators and sundries donated by the people of Puerto Rico to the people of Haiti. The barge set sail Friday afternoon. Puerto Rican authorities say that when it arrives in Haiti on Monday morning, it will be the largest single shipment of aid to arrive there since the January 12 earthquake. The roughly 4 million pounds of food are enough to feed the people of Port-au-Prince for a week. Organizers say it would take 150 planes to carry as much cargo. Jose Gonzalez Freye, the president of Pan American Grain, which paid for the barge's trip and 15 truckloads of food, says he hopes to see a conveyor belt of people emptying the barge of its contents when it arrives in Haiti. "If it goes into a warehouse, I'm going to scream," Gonzales Freye said. "This is not private property; it cannot be stolen," he said. He envisions Haitians burning the pallets to cook the beans and rice. Nonetheless, workers on the orange-and-black barge welded shut a deck-level door, in case it is swarmed. Puerto Rico Secretary of State Kenneth McClintock told CNN that arrangements are being made to put the food in a warehouse to ensure an orderly distribution. "It can't be the one who pushes and shoves the most that gets the most," he said. But while a tugboat sounded its horn and dozens of people waved at the departing Caribbean Pride barge Friday, there were signs the community's good will still needs to be aligned with available resources. An estimated 1,500 pallets of goods remained on the pier. No one has come forward with the $150,000 to hire a second barge to go to Haiti. "We're asking for someone to step forward to pay for the freight," Gonzalez Freye said. Nearby, dock workers who volunteered their time to load the Caribbean Pride said it was a labor of love. "God, he has a purpose for us," Daniel Marcano said. "If we do this for Haiti, Puerto Rico will be blessed." That sentiment was echoed by a sign on the stern of the barge. "Haiti, Porto Rico est avec vous," it read. Translation: "Haiti, Puerto Rico is with you."